(Nanowerk Spotlight) Since their discovery in the early 1990s, carbon nanotubes (CNTs) and carbon nanofibers (CNFs) have been used in a wide variety of applications. They have become indispensable in nanosciences and nanotechnology. However, because their production on an industrial scale remains expensive, their commercial use in such areas as catalysis has remained unthinkable. Current production processes including preparation of the support, normally silica or alumina, and impregnation with catalytically active metal for hydrocarbon decomposition, are not suitable for mass production. Researchers in Germany now report the fabrication of carbon nanotubes and carbon nanofibers on Mount Etna lavas used both as support and as catalyst, the first step for industrial production without preparation of support and its wet-chemical treatment. Such fabrication of CNTs/CNFs on naturally occurring minerals without synthetically prepared catalyst could pave the way for further exploitation of the superior properties of tailored nanostructured carbon for large-scale applications, such as catalysis and water purification by adsorption. Dr. Dang Sheng Su and Dr. Xiao-Wei Chen from the Fritz Haber Institute of the Max Planck Society in Berlin/Germany have used igneous rock from Mount Etna to produce carbon nanotubes and fibers directly by deposition from the gas phase. 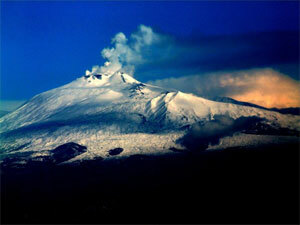 Etna is is the largest and most active volcano in Europe, currently standing about 3,326 m (10,910 ft) high. During its particularly violent eruptions in 2002 and 2003, several million cubic meters of lava were ejected. The fertility of mineral-rich volcanic soils has long been known; they support extensive agriculture, with vineyards and orchards spread across the lower slopes of the mountain and the broad Plain of Catania to the south. "The naturally occurring iron oxide particles in lava make it an effective natural catalyst, possibly smoothing the way to a more efficient production method," Su explains to Nanowerk. "This could lead to a sustainable use of natural resources for carbon nanomaterial production." Su and Chen published their findings, titled "Natural Lavas as Catalysts for Efficient Production of Carbon Nanotubes and Nanofibers", in the January 30, 2007 online edition of Angewandte Chemie International. Su and his colleagues wanted to elicit another, completely new sort of "fertility" for science. It could be amazingly helpful in the synthesis of carbon nanotubes and fibers. Lava rock is extremely porous and contains large quantities of finely divided iron oxides, the total amount of Fe2O3, as high as 11 wt%. The presence of iron oxide particles in Etna lava makes it an ideal material for growing and immobilizing nanocarbons. Metal particles such as iron are necessary for the catalytic growth of CNTs/CNFs. They catalyze the decomposition of the carbon source and control the growth kinetics of the tubes/fibers. The researchers pulverized the rocks and heated the crushed lava powder to 700°C under a hydrogen atmosphere. This reduces the iron oxide particles to elemental iron. When a mixture of the gases hydrogen and ethylene is directed over the powder, the iron particles catalyze the decomposition of ethylene to elemental carbon. This is deposited on the lava rock in the form of tiny tubes and fibers. Fabrication of CNTs/CNFs on naturally occurring minerals without synthetically prepared catalyst could pave the way for further exploitation of the superior properties of tailored nanostructured carbon for large-scale applications, such as catalysis and water purification by adsorption. "The crucial finding of this work is that the iron oxide particles abundantly present in minerals can be used as natural catalysts for CNT/CNF growth without any wet-chemical treatment of the support" says Su. "Since iron exists in a large number of minerals, clays, and soils, a new era may be opened for the cheaper production of immobilized CNTs/CNFs." Su and Chen also pint out another, quite different aspect to this work: From a geological point of view, the question arises if CNTs/CNFs can be formed during the evolution of Earth or the universe. If a carbon source is present, carbon nanotubes and fibers can be formed on minerals at relatively moderate temperatures. Volcanoes produce gases such as methane and hydrogen. Could these forms of carbon already have been generated on Earth millions of years ago? The prerequisites for CNT/CNF formation – atomic hydrogen, carbon oxides, and metallic iron – are also present in interstellar space. "Therefore the question arises if CNTs and CNFs exist in nature, and if so, how to find them" says Su.